Module 5 Unit 4. Signs are pictures that tell us something. 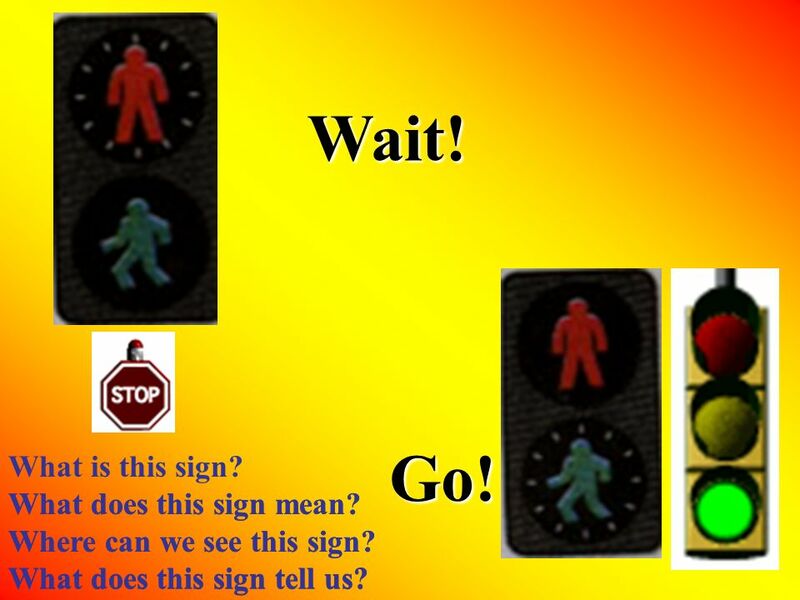 Signs tell us: instructions ( how to do something ) directions ( how and where to go ) warnings. 4 West End 1 hour 1 hour What does this sign mean? Where can we see this sign? What does this sign tell us? It means: turn left,then walk for one hour to West End. In a park. It tells us directions. 5 What does this sign tell us? What does this sign mean? Where can we see this sign? It means: you should wash the clothes by hand in cool water. 30 c On a piece of clothes. It tells us instructions. 6 What does this sign tell us? What does this sign mean? Where can we see this sign? It means: you mustnt eat or drink. In a library. It tells us warnings. 7 What does this sign mean? Where can we see this sign? What does this sign tell us? 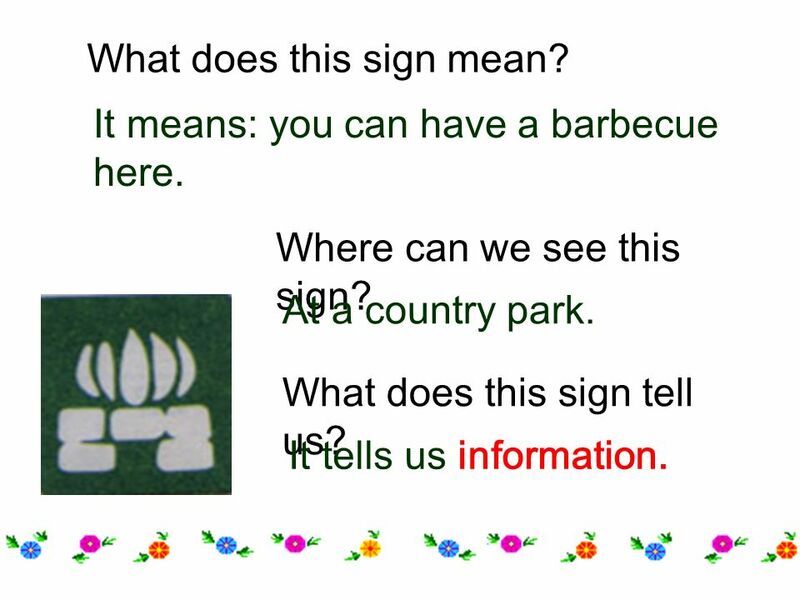 It means: you can have a barbecue here. At a country park. It tells us information. 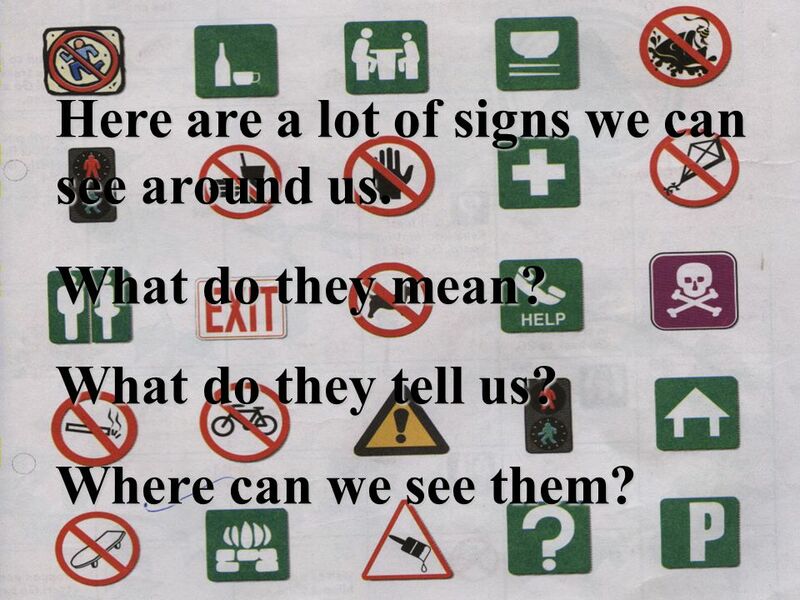 8 Here are a lot of signs we can see around us. What do they mean? What do they tell us? Where can we see them? 9 Dont run! 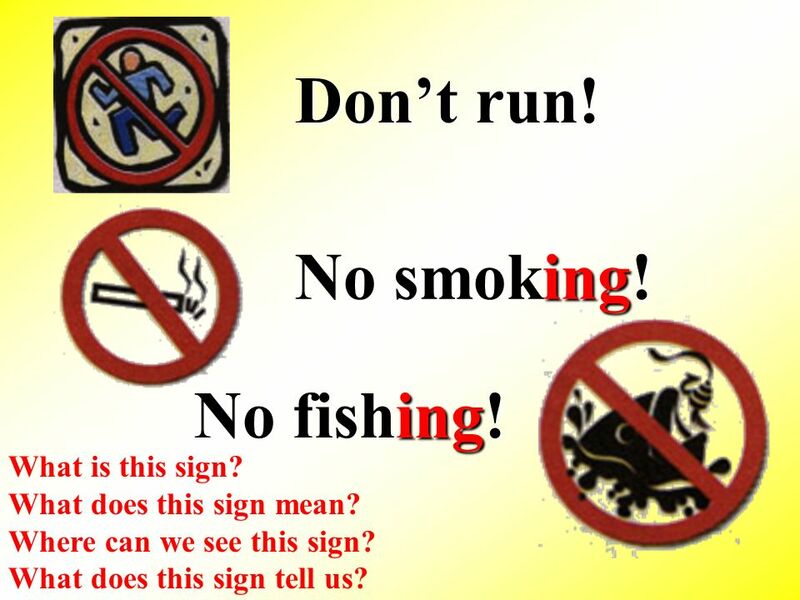 No fishing! No smoking! What is this sign? What does this sign mean? Where can we see this sign? What does this sign tell us? 10 No bicycles! No dogs! What does this sign mean? Where can we see this sign? What does this sign tell us? What is this sign? What does this sign mean? Where can we see this sign? 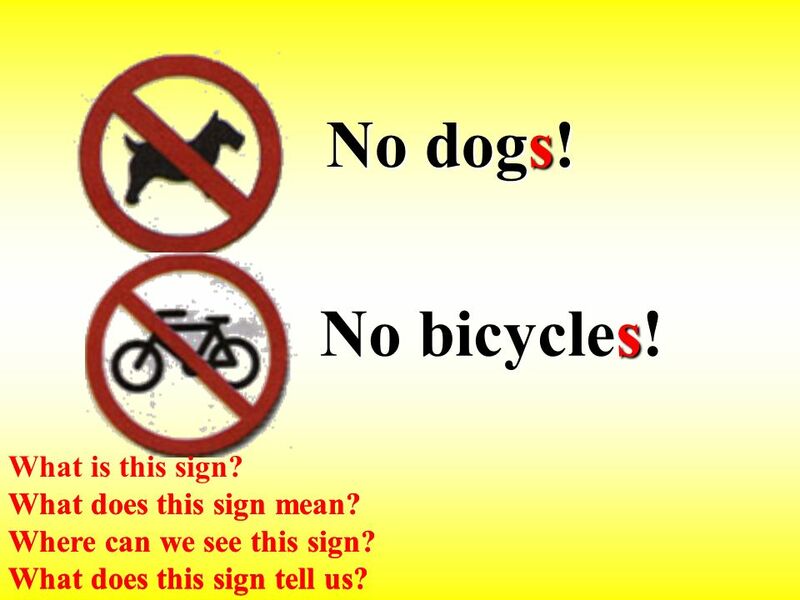 What does this sign tell us? 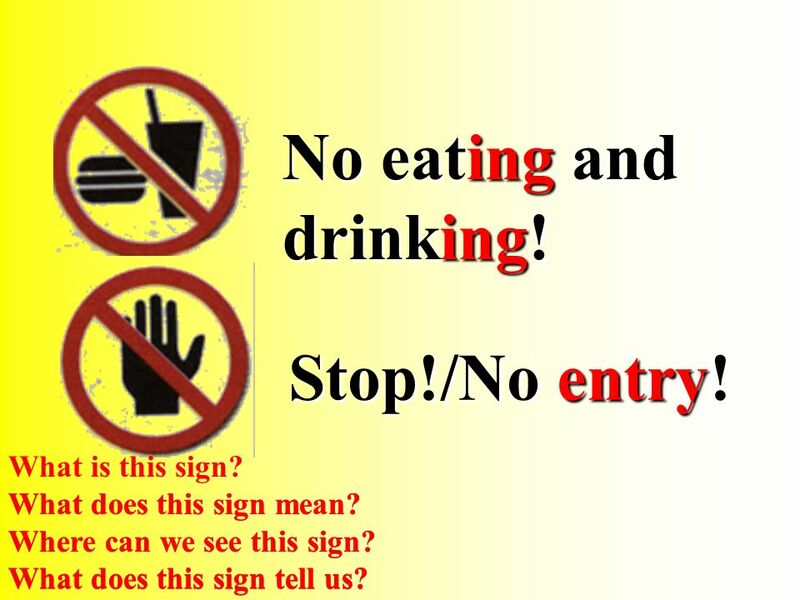 11 No eating and drinking! Stop!/No entry! What does this sign mean? Where can we see this sign? What does this sign tell us? What is this sign? What does this sign mean? Where can we see this sign? What does this sign tell us? 12 No flying kites! 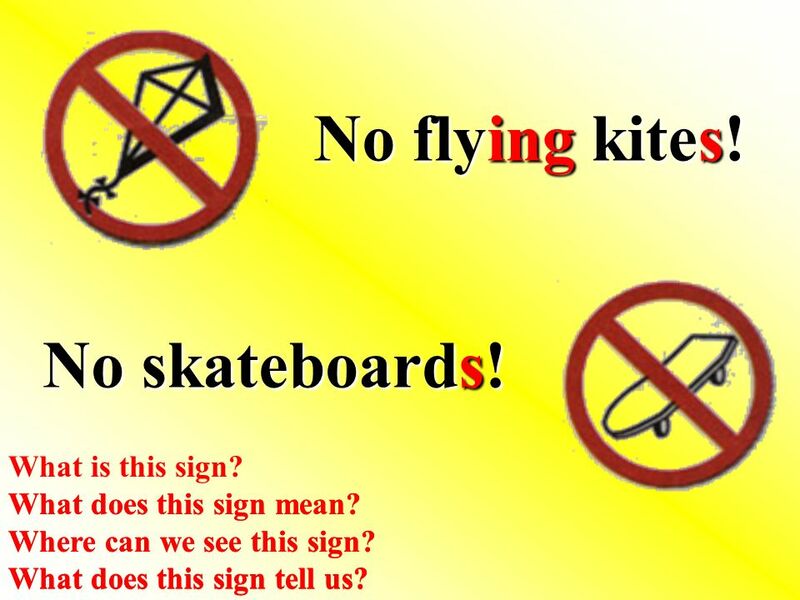 No skateboards! What does this sign mean? Where can we see this sign? What does this sign tell us? What is this sign? What does this sign mean? Where can we see this sign? What does this sign tell us? 13 Wet paint! Danger! What does this sign mean? Where can we see this sign? What does this sign tell us? 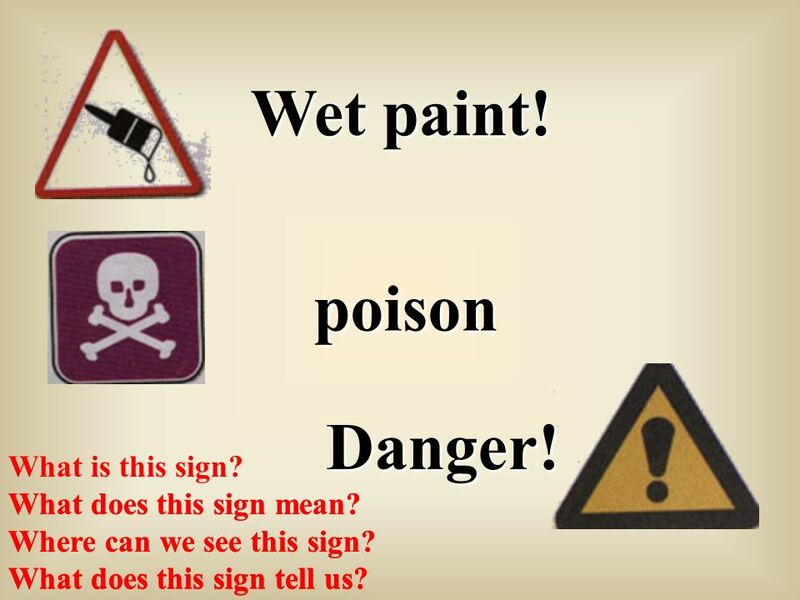 poison What is this sign? What does this sign mean? Where can we see this sign? What does this sign tell us? 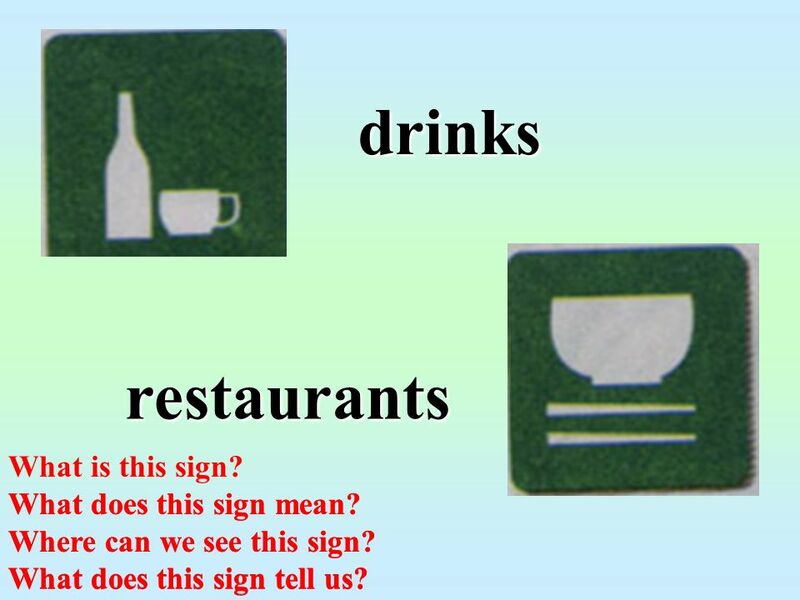 14 drinks restaurants What does this sign mean? Where can we see this sign? What does this sign tell us? What is this sign? What does this sign mean? Where can we see this sign? What does this sign tell us? 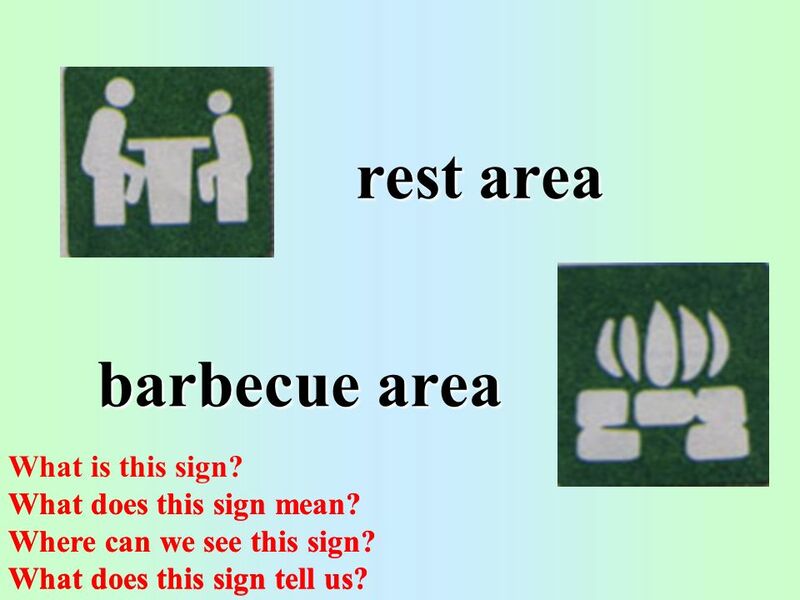 15 rest area barbecue area barbecue area What does this sign mean? Where can we see this sign? What does this sign tell us? What is this sign? What does this sign mean? Where can we see this sign? What does this sign tell us? 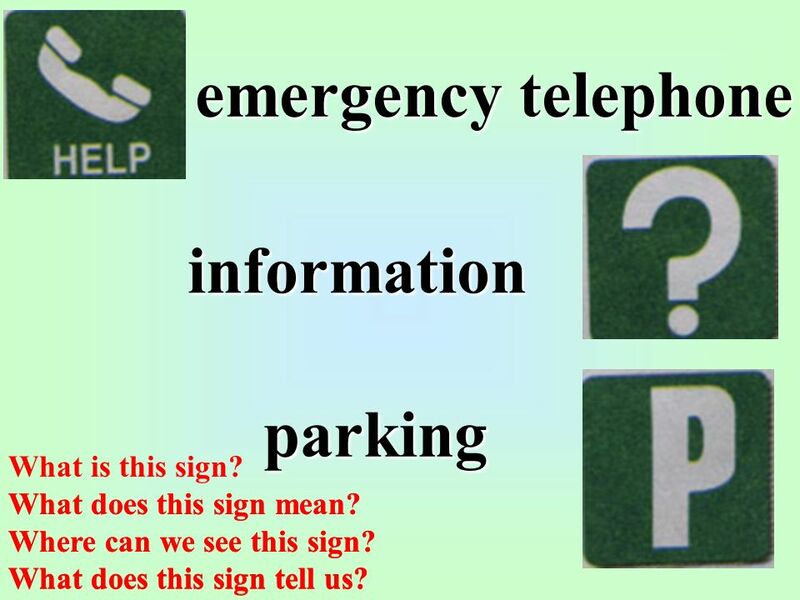 16 emergency telephone information parking What does this sign mean? Where can we see this sign? 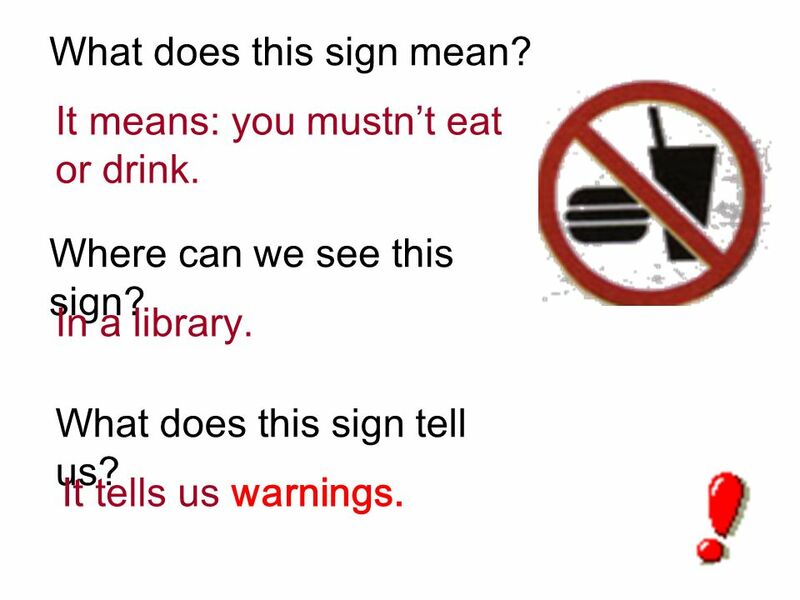 What does this sign tell us? What is this sign? What does this sign mean? Where can we see this sign? What does this sign tell us? 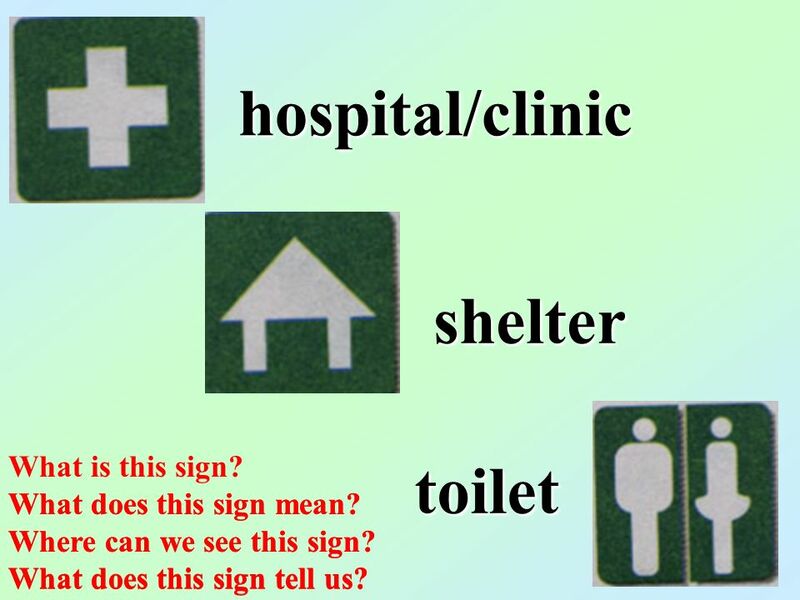 17 hospital/clinic shelter toilet What does this sign mean? Where can we see this sign? What does this sign tell us? What is this sign? What does this sign mean? Where can we see this sign? What does this sign tell us? 18 Wait! Go! What does this sign mean? Where can we see this sign? What does this sign tell us? What is this sign? What does this sign mean? Where can we see this sign? What does this sign tell us? 19 What does this sign mean? Where can we see this sign? What does this sign tell us? 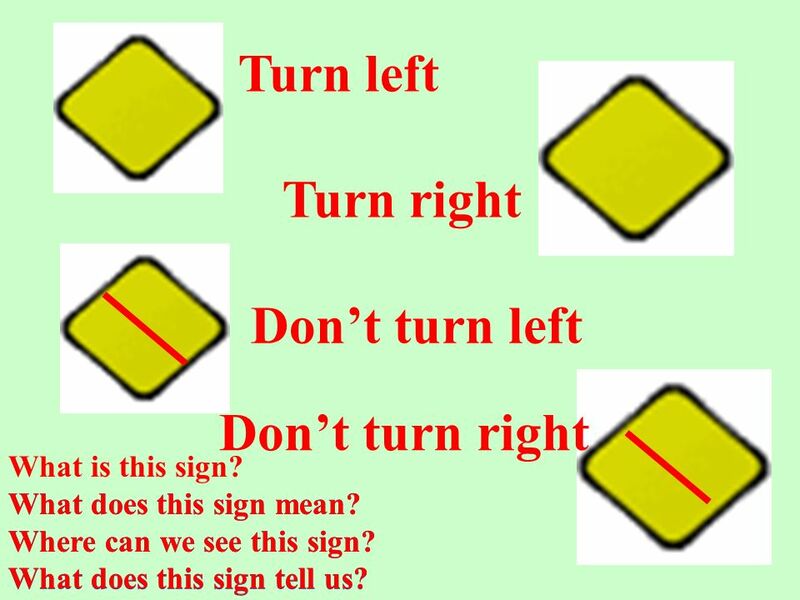 Turn left Turn right Dont turn left Dont turn right What is this sign? What does this sign mean? Where can we see this sign? What does this sign tell us? 20 Exit What does this sign mean? Where can we see this sign? What does this sign tell us? Entrance What is this sign? What does this sign mean? Where can we see this sign? What does this sign tell us? 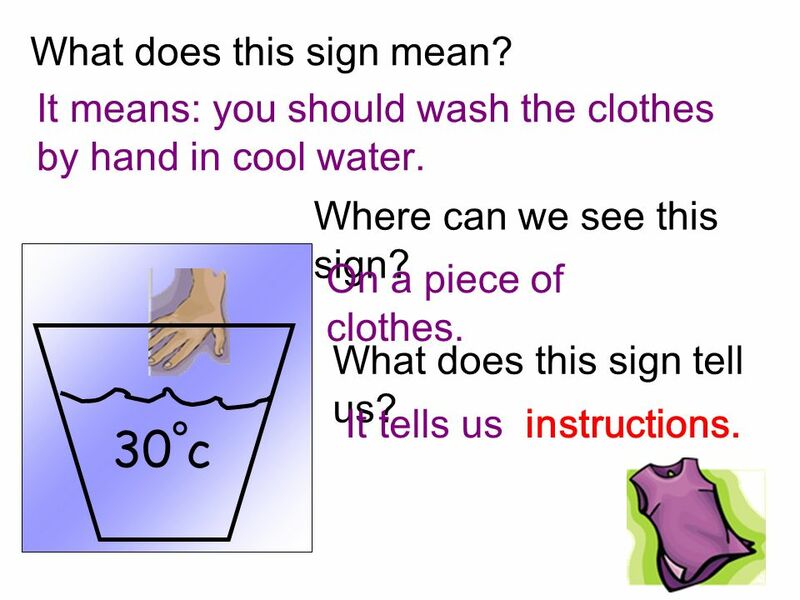 21 A: What does this sign mean? 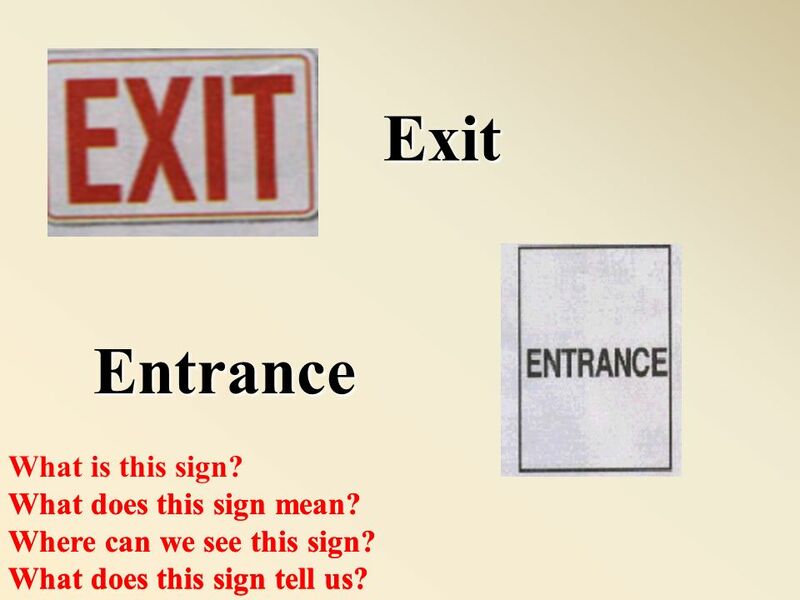 B: It means: you must/mustnt/there is/are… A: Where can we see this sign? B: In a swimming pool/At a country park/In a park… A: Where else can we see this sign? 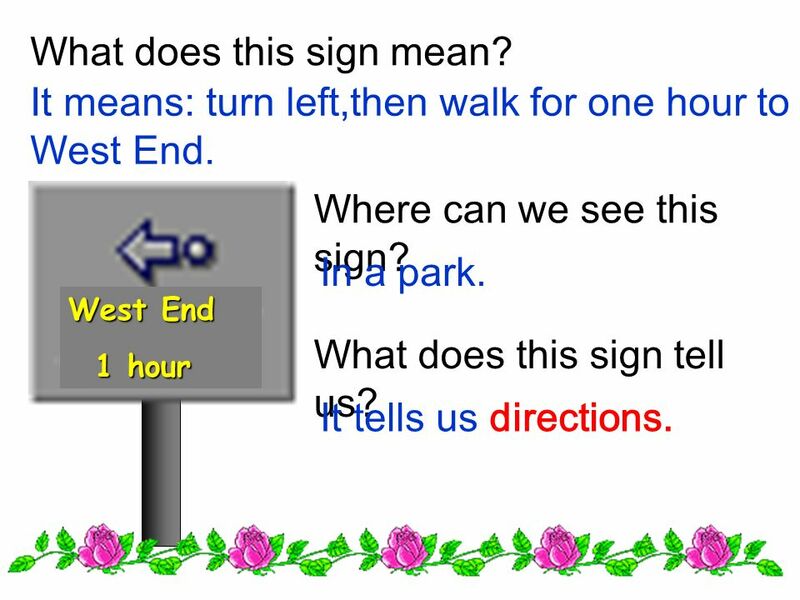 B: … A: What does this sign tell us? 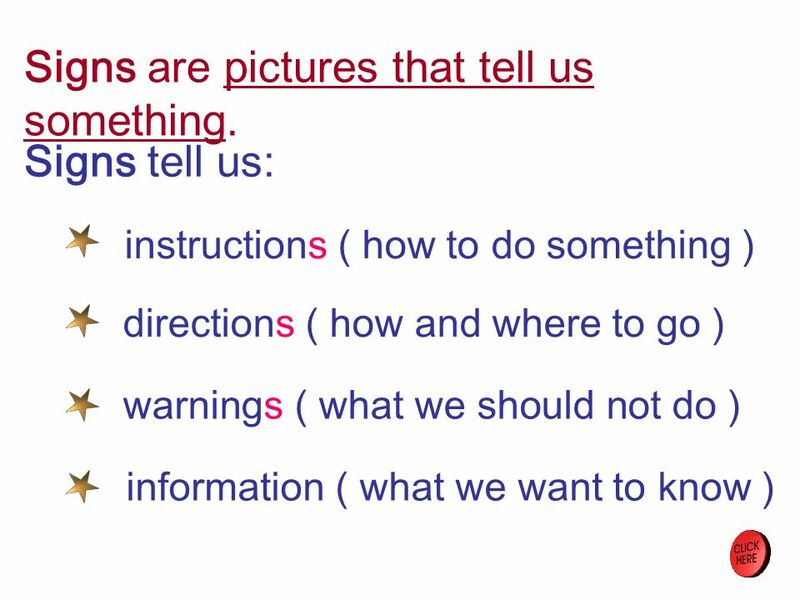 B: It tells us directions/instructions/warnings/information. 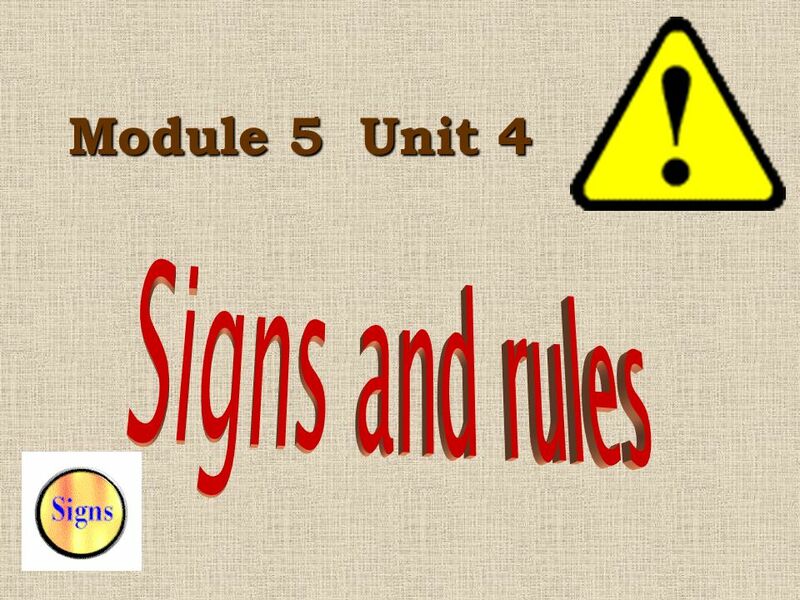 Download ppt "Module 5 Unit 4. Signs are pictures that tell us something. 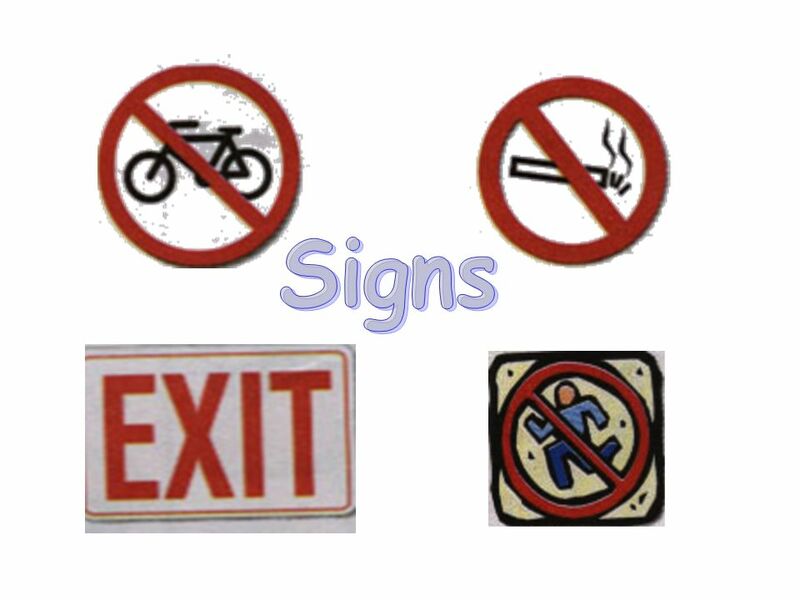 Signs tell us: instructions ( how to do something ) directions ( how and where to go ) warnings." What does it mean? It means… What does it mean ? public signs. Book p.38 I am caring, Kind and true. I am a good Friend to you. We have good times, Rain or sun. Two is much more Fun than one. PLACES. To watch a movie, you go to the… cinema To borrow a book, you go to the… library. 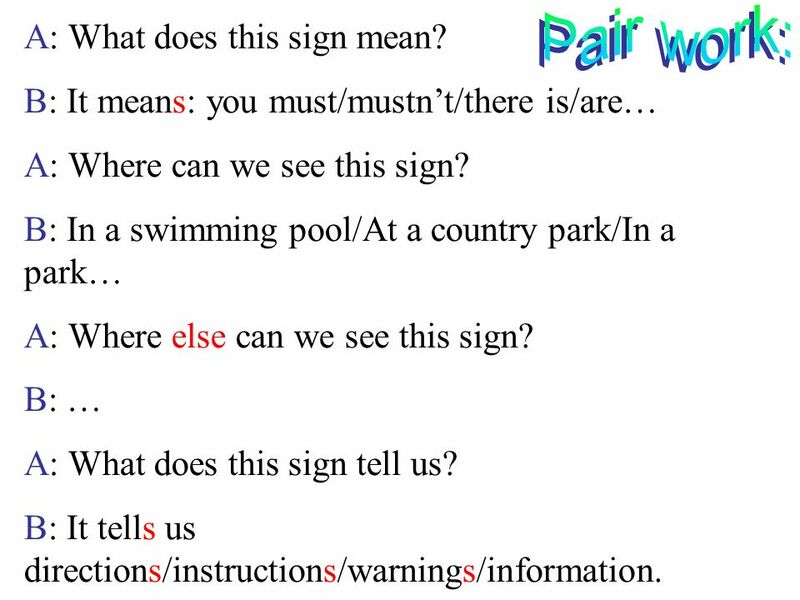 ENGLISH 6 UNIT ACTIVITY 1: In pairs, ask and answer about the following pictures. - What is she doing? - He is playing the piano For. How do we know whether people are healthy? Is it easy or hard to tell? SAMPLE SLIDE Random Slides From This PowerPoint Show. INSTRUCTIONS 1.Divide the class into two teams. Have the students in each team form a line and give a ball to the first student on the line. 2.Start the. Class 6 Designed by Marina V. Bedniagina School 32 Nizhniy Tagil 2010. Working Safely This presentation is designed to assist team leaders, supervisors and trainers explain and reinforce to supported employees within the. MUST & MUSTN’T. We use must not to say that something is not permitted or allowed, for example: Passengers must not talk to the driver. Mustn't I mustn't. MarilynWebster Water Lesson 1 Learning outcomes To raise awareness that water is not always accessible to people To understand how we use water. To know.  17. He is c ____ the room.  18. My parents like reading n______ after lunch.  19. Do you want to j____ me for dinner?  20. I think w____ clothes is.